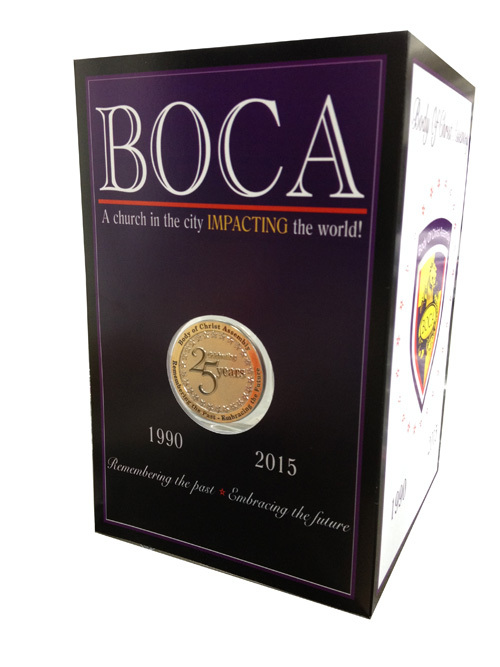 BOCA Church recently approached us for a solution. 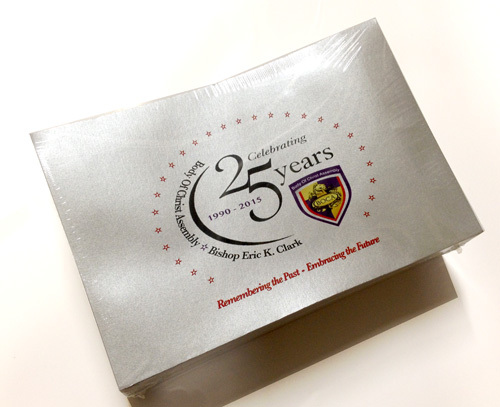 They are celebrating 25 years of serving their community. There is a lot to celebrate – having grown from nine worshipers at their first service to currently serving over 800 families with 20 outreach ministries. 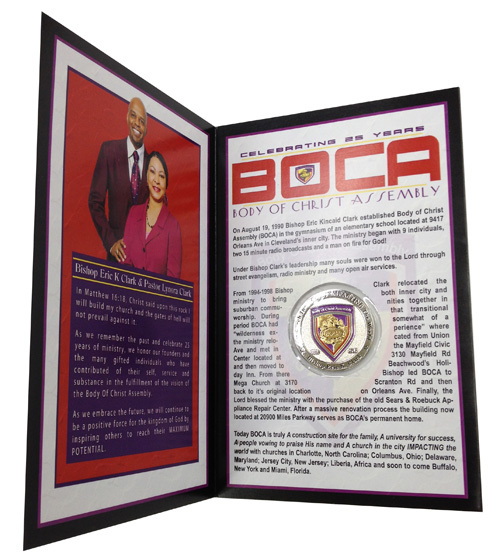 The church minted commemorative coins to mark the occasion and needed a suitable holder. They had ordered the coins from a distributor. Sometimes these coins come with a hard plastic case, but these had arrived in soft plastic pouches. Time was of the essence and the distributor was not able to furnish the plastic cases in time for the festivities. Alissa, one of our sales and customer service representatives, met with someone from the church to get clear understanding of the outcome they desired. She researched different options and then met with Erich, our head graphic designer, and Mike, our plant manager, to get their input. They put their heads together and came up with an elegant solution. 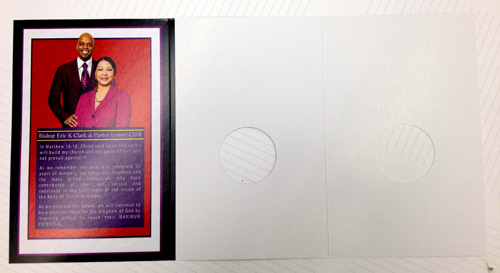 We printed a presentation booklet on 12ptC2S, a firm glossy cardstock. It was die cut and scored as you can see in the photos below with a hole to fit the coin. 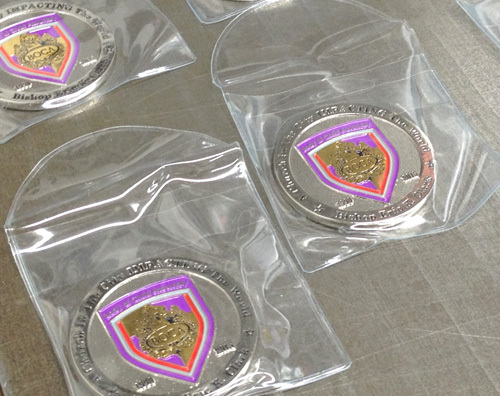 We were able to keep them in the soft plastic pouches which serves to protect the coin. The coin was positioned in the hole and the booklet was glued together to hold the coin in place. 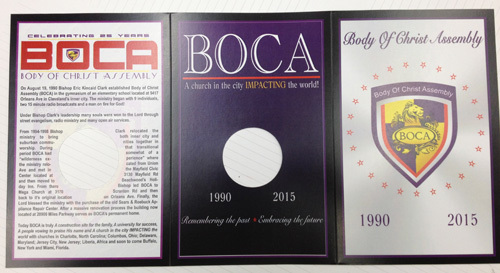 The church had special anniversary artwork for the envelope to hold the booklet. Alissa was able to locate a special silver metallic envelope just the right size to hold the booklet. We printed the artwork on the envelopes for a perfect finishing touch. It was a true collaborative team effort, and everyone was thrilled with the results. This entry was posted in Concept, Design, Marketing, Print, solutions and tagged marketing materials, out of the box, problem solving, promotional, solutions. Bookmark the permalink.